I'm faced with having to choose between three text editors thanks to some bad timing. In process I confront software pricing in 2017. Seems like I've found myself in a perfect storm. My current text editor for macOS is MultiMarkdown Composer (MMC), which was just updated to version 4, having been in beta for a number of years. MMC version 4, in which I'm writing this post, has a number of new features, most of which I've not yet fully explored. Ordinarily, a new version of a product I like is a source of joy and typically, I'm pretty quick to upgrade. Alas, this is 2017 and the equation is not as simple as it once was. 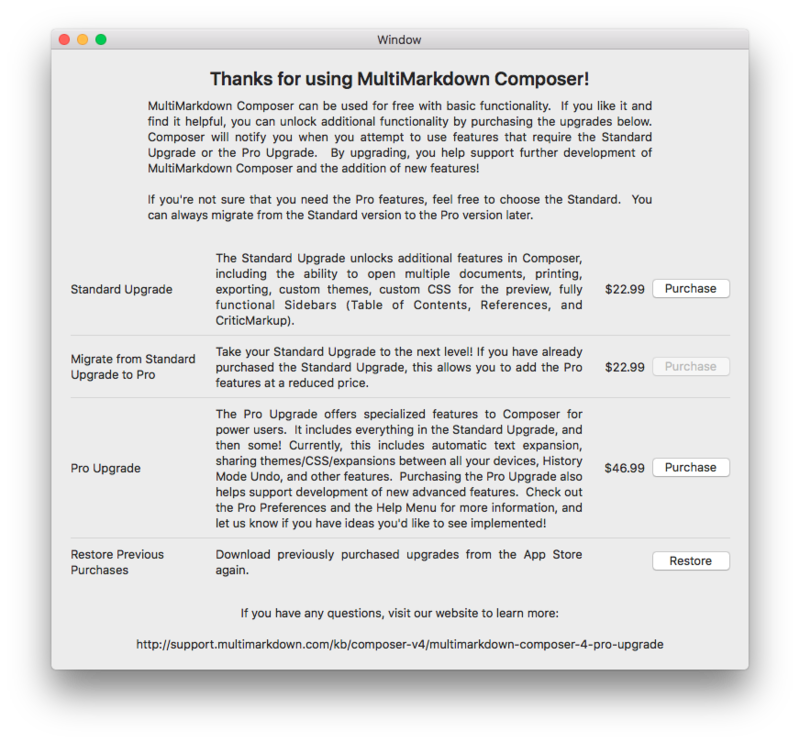 Leaving aside the bugs in this new release (there's been a few but the developer, Fletcher Penny to his credit is on the ball), MultiMarkdown Composer has introduced a new pricing model that's made me roll my eyes: free, standard and pro. MultiMarkdown Composer is also macOS only. There's no version for iOS and these days I'm doing more and more writing on my iPad. Buying into MMC, means I still have to shop around for an iOS markdown editor (assuming I decide to relegate Editorial for well, editorial). Meanwhile, I've written a review of Ulysses, which has adopted a subscription model. I like Ulysses but a couple of features left me cold and subscription pricing leaves a nasty taste in the mouth. However, the subscription price does unlock both the macOS and iOS versions, which is good value and goes a long way to simplifying and unifying my markdown writing experience. To complicate life, I'm currently writing a review of iA Writer, which has a lot of promise. In someways it occupies the space between MMC and Ulysses. It's business model is more traditional (assuming I can call app store pricing traditional). Use the trial version (macOS only) and if you like it, pony up $31 dollars plus the cost of the companion iOS app ($8)1. The trial version of iA Writer I'm using on my MacBook Air expired today and so I feel I should make a decision. It's a first world problem, I know.